Paul and Marilyn Mahlberg in the News! Written by Patty Williamson of the Peninsula Pulse Newspaper. Written by Jim Lundstrom of the Peninsula Pulse Newspaper. Fans of Kangaroo Lake had two great pieces of news at the annual meeting of the Kangaroo Lake Association at Baileys Harbor Town Hall July 7. It is in excellent health for a shallow lowland drainage lake. 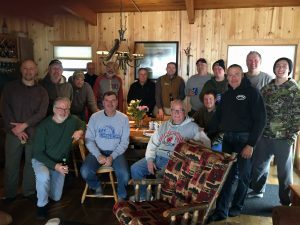 The Kangaroo Lake Association (KLA) is partly responsible for that healthy status, and the organization is considered the “gold standard” among lake associations in the state. Read more here: Peninsula Pulse Article. Keep Our Lake Healthy – Inspect, Remove, Drain, Never Move! Aquatic Invasive Species educational outreach video. Brought to you by Washington and Waukesha Counties. We do not own anything but the video clips used in this video. Rights go to the official holders to the copyrights. No copyright infringement intended. Used strictly educational and entertainment purposes. The Kangaroo Lake Association now has an active Facebook group page! This is wonderful news for those homeowners on the lake who want up-to-the-minute information. While this page does not replace the KLA website; it is just another platform for which information can be passed along, albeit in a much timelier fashion. It’s the place where you discover someone’s sighting of a special bird, or even a grandchild’s first fish catch. Or, a bit of lake reminiscing. For those of you not familiar with Facebook, just consider it to be a river of information that you dipstick into when you log in. It’s an easy way to post a lost-and-found photo of a random canoe paddle or lake toy that washed up on your shoreline from a recent storm. Folks who aren’t at the lake will enjoy the pulse of activity when others share their observations. Because posts are monitored, we will adhere to our policy of deleting comments that are political in nature or not family friendly. A clear code of conduct is posted in the group. Let’s keep this fun and lighthearted! Join our group today by logging into www.facebook.com and searching for “Kangaroo Lake Association”. The Kangaroo Lake Association(KLA) and The Nature Conservancy(TNC) continued their “Fish Stick Partnership” on February 17, 2018 in Door County. 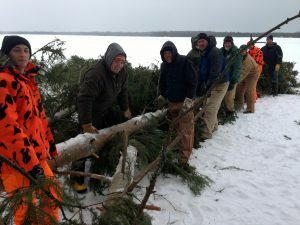 “Fish Sticks,” are woody habitat structures that utilize whole cut live trees grouped together and secured to the shoreline, helping to restore shoreline habitat. This fish and wildlife habitat WDNR best practice creates food, shelter, and breeding areas for all sorts of creaures from small aquatic insets, frogs, fish, turtles, ducks, and songbirds. Thanks to funding this year by the Lakeshore Natural Resource Partnership, our four-year efforts continued placing 23 more trees that are 35′-55′ in length. 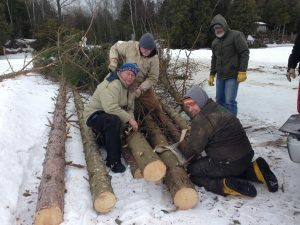 The Nature Conservancy owns land on Kangaroo Lake and needs to “thin” their forest area. Both organizations want to improve the woody habitat on the shoreline thus creating this ideal “win-win” opporunity. 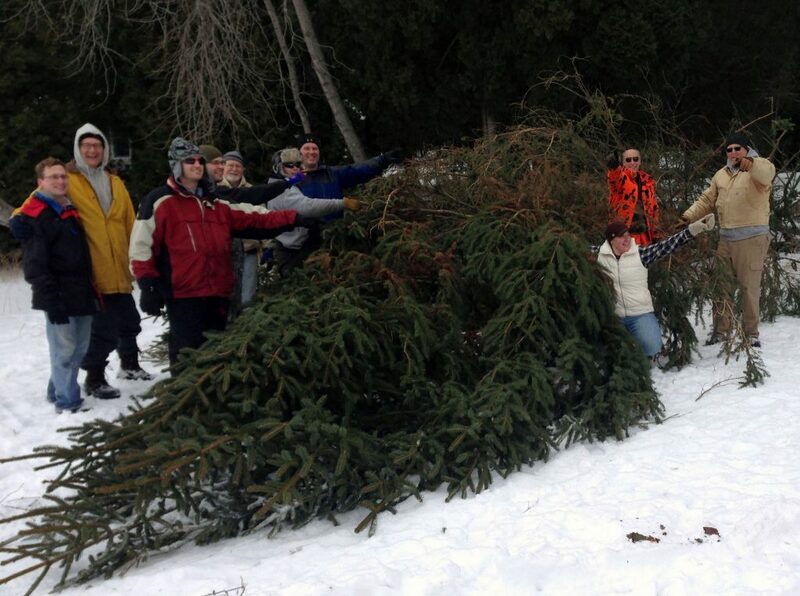 Most of the trees were Norway Spruce and Red Pine trees. We reached a milestone in 2018 having placed our 100th tree in four years. We now have 28 “hosts” with 5 sites having multiple 3-tree complexes. The ice and weather conditions were perfect for our 18 volunteers who placed and secured the trees manually on the shoreline. A truck drags the trees to our various locations around the lake. Ninety (90%) percent of the life in a lake has its origins on the shoreline. 608-217-9460 or TNC’s Mike Grimm, Conservation Ecologist ([email protected]) 920-743-8695. Need for Fish Stick Hosts! Please help! We have great news: we’ve received new funding for additional Fish Sticks installation in February, 2018. But, we only have a few hosts and we need more. 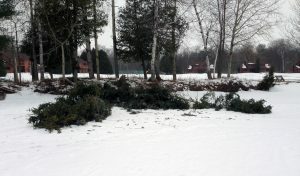 We’d like to put in 30 trees again and have only 9 trees, or 3 complexes so far. We need your help in identifying hosts…your neighbor? friends? Would you be willing to reach out to them? A mailing is going to all land owners, but your personal invitation is what works the best. If someone is interested, please send their info to [email protected] and we will email them information right away. We need to act now as they need to sign an agreement and we need to mark the location(s). If your place could handle more fish sticks, that would be awesome as well. Please help now. Thanks for helping! The WI-DNR’s Steve Hogler (our lake’s Fish Biologist) and Mary Gansberg informed our Association back in April that we were selected to receive a 2016 “Fisheries Partnership Award” for our region. The award recognizes an organization as a “partner who is going far and beyond” assisting WI-DNR in its mission. Only one award is given annually per each of the 5 regions in the state. The award recognizes the Kangaroo Lake Association for the tremendous work we’ve been doing “over the years.” This includes our Bulrush and Fish Sticks (Shoreline Restoration) efforts as well as our efforts with mapping and manually removing milfoil, water testing, website information and education, protecting shorelines with no wake buoys, fish cribs, other studies, etc. Here is the letter that Steve wrote nominating us for the award. 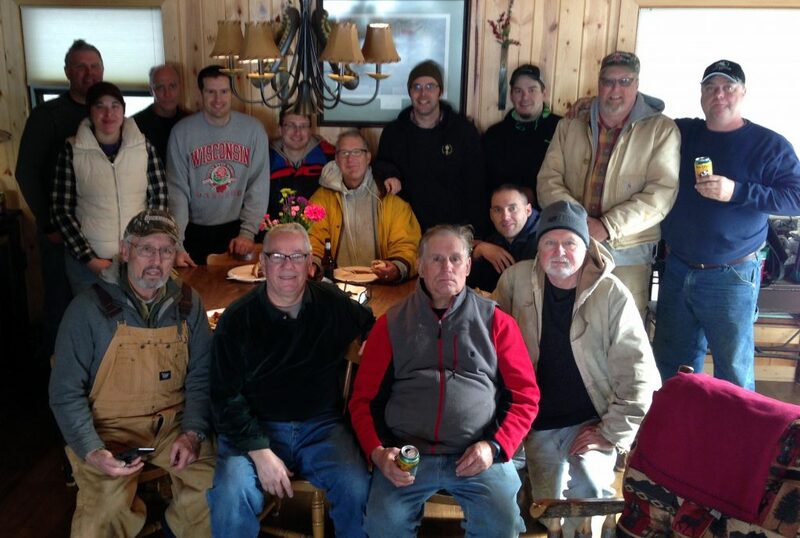 Members of the Kangaroo Lake Association (KLA) gathered at the Ridges Sanctuary in Baileys Harbor the morning of September 10, 2016 for the presentation of the award from the Wisconsin Department of Natural Resources (DNR). Here is an article in the Door County Pulse describing the celebration. Read Tom’s first-hand account of the day: Guys on Ice III. We are beginning a list of members who want to host a Fish Stick complex in winter, 2017. For more information, contact Tom Schneider. Here’s more information on our Shoreline Preservation Grant. On June 15, 2015, KLA’s representative, Wisconsin Lakes, sent a letter to Wisconsin’s Joint Finance Committee and the Legislature in opposition to the shoreland zoning restriction inserted into the state budget proposal. There were 59 lake and river associations and 32 counties including Door County, that sent the strong message: Don’t do it! Don’t insert this major change into the budget bill without public input because it has nothing to do with the state budget. This shouldn’t be the way we do the peoples’ business in Wisconsin. Motion #520 was included in the budget bill. Our state Assembly and Senate passed the bill and it was signed into law by the governor. For almost 4 decades, the system of county-determined standards that could exceed the minimum state standards, worked for 30 counties and has served Wisconsin lakes very well protecting our lakes, shorelines, rivers, and streams.